f you are as much of a web addict as we are, we think that you'll enjoy looking at some of the sites below. They are culled from our own membership's bookmark files, and we think they are some of the most helpful, educational, and interesting sites on the web. Please contact the Webmaster if you have additions or changes for this list. Renaissance Festival Books View 253 digitized Renaissance festival books (selected from over 2,000 in the British Library's collection) that describe the magnificent festivals and ceremonies that took place in Europe between 1475 and 1700 - marriages and funerals of royalty and nobility, coronations, stately entries into cities and other grand events. A Compendium of Common Knowledge A fabulous resource for the Elizabethan re-enactor -- Anything and everything you ever wanted to know about the period. Includes a full version of the site's information for downloading and printing. Renaissance studies - Medieval History Web Links Well, here's a place to get lost. Quotes Rick: "There are articles on all sorts of arcane stuff with links to still more." Renaissance studies - Renaissance History Web Links I found this while getting lost in the previous link. Don't plan on doing anything this evening. The Corporation of London - History The Corporation of London is older than Parliament -- read about its history here. Among other things, this site has a full chronological list of the Livery companies (=guilds) and their extant websites. 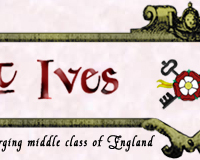 Records of an English Village 1375-1854 This link is really amazing. It has transcripts of various official records (Church, State, Court, etc) in some cases from as far back as 1375 AD up through 1854 from a village 40 miles northeast of London. Population fluctuated between 500 to 1000 over that period of time. Most of the records go back to the 1560's or thereabouts. While I wish that they had recorded more details in some of the entries, there is definitely a real wealth of reenactment information to be gleaned from this site. The Shakespeare Resource Center An incredible amount of stuff on Shakespeare, well organized. A quote from the main page: "This was originally a class project for my Masters degree. 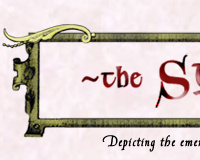 What I've tried to accomplish is a website that deals not only with Shakespeare's literature, but explores Shakespeare as a man and the environment in which he lived and wrote." 'nuff said. Wikimedia Commons Portraits from our period: especially look at group photos. This site is new and continually expanding; keep checking back! Companion: 1490-1920 The history of dance and manners. It is maintained by the Library of Congress and contains the full text, both in HTML and in TIFF (images of the actual pages) of over a hundred dancing manuals, books of etiquette and tirades against the evils of dance, from the 15th to the 20th Century. 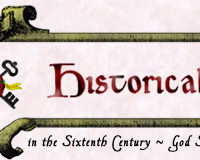 Histrenact A server for all forms of reenactment and living history -- all around the world. Renaissance Entertainment Productions The official site of Renaissance Entertainment Productions, the company that runs, among other things, the Southern California Renaissance Pleasure Faire. Lots of good information. The Directorie of Renaissance Faires A beautifully laid-out site. From the title page: "From here you can find Faires & Festivals...links to Clans, Guilds, Reenactment Groups, Musicians and more...Webrings to follow...and even the olde English game of Farkle. Come in and join us." The Bankeside Schole of Defense The Bankeside Schole of Defense is an historical stage combat school located in Southern California, dedicated to the study of European swordsmanship with an emphasis on Italian 16th century rapier fighting. 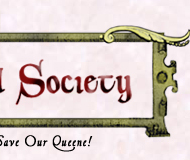 The Guild of St. George A noble's guild based out of Southern California, and a wonderful resource on the period and costuming tips for the well-to-do. The Seadogs ...site Mark 2. Her Majesty's Navy, whether they like it or not. A performing group of Singers, Actors, Musicians, Comedians, and all-around weirdos in the true Renaissance style. St. Michael's Barber Surgeons, those feisty Germans, lots of guys with pointy things. The Poxy Boggards The drinking group with a singing problem. You can order their CDs here, too. ABE Books I'm giving up one of my biggest secrets to finding rare and out-of-print books: this is a HUGE search engine connecting hundreds of booksellers from the US, Canada, and the UK. Want lists are available for the making -- so they email you when a book is listed. Invaluable for completing your Roy Strong or A.L. Rowse collection. Acanthus Books This site is instrumental in finding reproductions of period documents: Acanthus specializes in cookbook facsimile reprints, as well as food history, dining etiquette, and gardening titles, from antiquity to early 20th century.